In the tradition of the Ancient Israelites and the Israelite Samaritans, tefillin (Hebrew: תפילין) is the Aramaic translation of the Hebrew totafot (reminder) in the Torah. Jews understand the meaning literally. Their tefillin consist of small, black leather boxes containing parchment inscribed with verses from the Torah. Jews bind them to the forehead (tefillin rosh) and to the arm (tefillin yad). They adopted this interpretation early in the schism between Jews and Samaritans. Archaeologists found tefillin of the head (tefillin shel rosh) dating from the first century CE at Masada. In Judaism, the tying of tefillin shel yad on the arm originated with the exodus from Egypt. However, the exodus is an account of liberation from slavery, and it is illogical to connect freedom with binding. Israelite Samaritans select verses from the Torah with particularly holy qualities, a blessing, or an uplifting message. 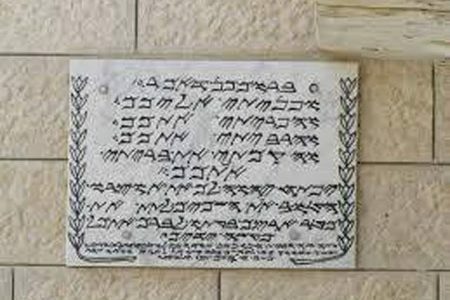 Then, they engrave the verses in ancient Hebrew on panels of marble, and place them in their homes. Alternatively, they write the verses on parchment in elegant calligraphy, and hang them on the walls of their homes. The more mezuzot hanging on the walls, the better! The Second Temple Period saw further rabbinic regulations. At that time, Judaism sought to distance itself from the influence of the Israelite Samaritans. In a few cities, and in many villages, mixed populations of Jews and Samaritans lived together. Rabbinic Judaism imposed new regulations, such as the change from Hebrew script to Aramaic; the Pleasures of Shabbat; candle lighting; the timing of the Counting of the Omer; starting the New Year at the beginning of the seventh month; and relaxing the laws of purity and impurity during a woman’s monthly period. (Rather than complete separation, Jewish women continued to cook, and to take care of their home and children). These Rabbinic regulations contradict the written Torah, in both its Jewish and Samaritan versions. Rabbinic Judaism modified them in what Jews call The Oral Torah. They did it because they wanted to differentiate themselves from the Israelite Samaritans. I smile sometimes, when reading learned articles about ‘the separation of the Samaritans from the Jews’, written in the patronising tone of these ‘scholars’. Rather, the separation set Judaism apart from the Samaritans, and from many commandments of the Torah. The evidence shows that in the compilation of the Mishna and Talmud, it was the Jewish rabbis who distanced themselves from the Samaritans, and not the other way round. Today, you can find numerous rabbinic Jews, who patronisingly reject the Israelite Samaritans. They also reject Jewish streams who behave differently from themselves. But not a single Israelite Samaritan will deny that the Jews are an integral part of Israel. The Jews and Samaritans are truly brothers. The similarities are unbelievable. 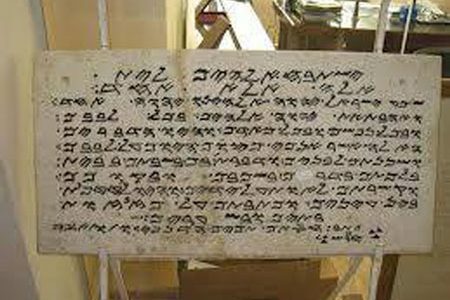 The sages in the Talmud were aware of Paleo Hebrew being the original script and some of them (for instance Mar Zutra) held that the original scroll written by Moses himself was written in Paleo Hebrew. I wanted to ask a question about Tzitzith. I have seen the Samaritan priests wearing a garment very similar to a talleth, with blue stripes – on this there are tassles like tzitzit. My question is did the Samaritans used to put techelet on the tzitzit? Did they think it had to be specially sourced from a sea creature called the chilazon (this is what the Jews believed from their traditions) or could any source be used that gives a blue dye. The Jews very recently rediscovered the techelet as being the Murex Trunculus snail. There is vast evidence supporting this – both secular (archaelogical and scientific) and talmudic support from certain passages describing techelet. There is currently many Jews using Murex dye (including myself) – although some are skeptical due to a lack of chain of tradition, so refuse to wear it and are in doubt. It is not uncommon for a passage to make use of literal and metaphoric terms. I would say this is a form of exegetical consistency in that the passage demands that we consider both, and therein lays its beauty. The exegesis rules must yield and conform to the diversity of the text. To Dovid: This is lack of exegetical consistency. Contrast it to the Karaite Jewish position where both Totafot & Mezuzot are interpreted spiritually/metaphorically. How is it that you actually put Mezuzot on the doorpost, thus taking the last verse of the Shema literally, but you don’t take the previous verse as literally, just metaphorically? Do the Samaritans wear tzit tzits? Shalom Kim. I apologise for the delay in my reply; it is a busy time of festivals and preparations for my international tour. Yes, they are 22 tassels on the right upper wing of the white garment, from 22 loops on the left upper wing of the garment.